The case will be released on Friday 20 April at 9am Australian Eastern Standard Time (AEST) and submissions are due on Friday 27 April at 5pm AEST, giving you one week to work on your presentation. Successful Victorian participants will be invited to present at the University of Melbourne heats on Monday 30 April 6-9pm. Successful interstate participants will be contacted to make alternative arrangements. You can register to compete right up until the case closes on Friday April 27. How many rounds are in the competition? There are two official rounds of presentations in PPCC. Students must submit their responses in the form of a slide deck (saved in PDF format) by 5pm AEST on Friday 27 April. The top submissions will then be invited to present at heats to deliver their response in a 15 minute presentation, with a 10 minute question & answer section from a panel of judges. The top teams from heats will then progress through to the National Finals at the University of Melbourne where they will present with the same format. Are there restrictions to the slide deck submission? Yes, slide decks must be no larger than 10 slides in total excluding title, transition and appendix slides. Where and when do I submit our slide deck? Email ppcc@economicstudents.com by 5pm AEST on Friday April 27. How many people can register as a team? Teams should consist of 2-4 people. You can register as a team here. If you would like to register by yourself, you may complete the form as an individual. We will then match you with a group of individuals a few days prior to the commencement of case week. We will communicate this information to you via email addresses that you used to register. Can interstate or international teams register? As long as you are a current undergraduate or postgraduate student at an Australian university. 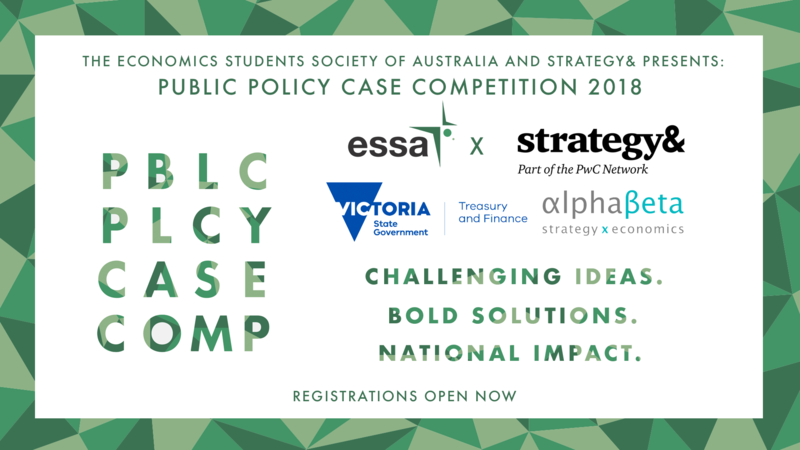 We highly encourage interstate teams to register, and teams that are successful in progressing to the finals will have their flights to Melbourne and accommodation for the duration of the finals covered by the Economics Students Society of Australia. Can teams be made up of members from different states? Yes! Students are welcome to have team members from different states. If successful in progressing to the National Finals, interstate team members will be flown to Melbourne for the Finals presentation. I’m only enrolled at a university for semester 1, can I still participate? As long as you are an enrolled university student at the time of the competition, you are welcome to participate in the Public Policy Case Competition. When will we be notified if we were successful in progressing through to heats? You will be informed on the afternoon of Saturday April 28. There will be no opportunity to alter the slide decks between email submission and heat presentations if you are successful. When will we be notified if we were successful in progressing through to finals? You will be informed on the evening of Monday April 30. There will be a short window until Wednesday May 2 at 5 PM (AEST) to alter the slide decks to incorporate any of the judge’s feedback or improve the existing slide deck submission. Who will be judging the heats and finals? Both heats and finals will be judged by representatives from our sponsoring partners including Strategy&, the Victorian Government’s Department of Treasury and Finance, AlphaBeta, Deloitte Access Economics, academics and our affiliates. Please note that judges may vary between the Heats and Finals. What are the requirements to be eligible for the first year prize? All team members must be in the first year of the of their undergraduate degree. If the first-year team is successful in placing 1st in the National Finals, they will also receive the Overall Prize in addition to the First-Years Prize. I have a question that hasn’t yet been answered. Help me. Email us at ppcc@economicstudents.com and we will get back to you as soon as we can!